Does Doc Ock grab attention or will he end up as another day at the office for Spider-Man? As Peter Parker struggles to maintain his personal life he begins to question his role as Spider-Man. But, when the city is threatened by scientist Doctor “Octopus” Otto Octavius, there’s only one city hero who can stop him. 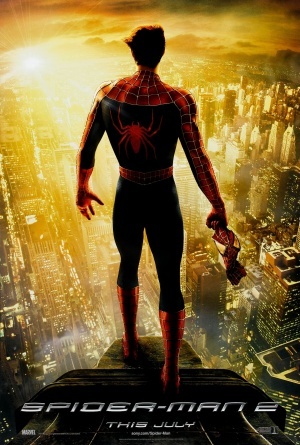 Spider-Man 2 begins two years after the previous film, and Parker has seemingly started to grow up: he’s graduated from school and is in college, he has his own apartment, and now has more developed relationships and friends. This progression in reflected in Spider-Man as his own character, as he is now well known and recognised within the city. This change for both of them is subtle but a credit to the film and helps engage the viewer with the growing lead. Whereas the previous film’s only villain was Green Goblin, we now see one main villain in Doctor Octopus as well as the increasing villainy growing in Harry Osbourne. Harry is consistently seen to be growing darker and more evil by his own choice, and this is outlined with harsh lighting and Harry showing an ugly side while drunk. Whereas this creates a very interesting and enjoyable transformation to watch, Doc Ock is unfortunately largely boring and never really captures any interest which is a major problem as he is the main villain. His main selling point are the four metal arms attached to his nervous system that take the characteristics of snakes, but he’s never actually explored as a character and is destined to just be a passing villain that will eventually be defeated. As an interesting twist, Peter Parker loses his Spider-Man powers and questions his position as the city’s saviour mid-way through. But unfortunately this is never really capitalised on; it could have been visited as a serious element for Spider-Man to overcome, but the lack of commitment only proves to let down a lengthy lull in the film with a non-interesting and half-committed story. The progression of the franchise since the previous film is certainly evident by allowing Parker and Spider-Man to develop as characters but without an interesting villain or any serious threat Spider-Man 2 is a lightweight version of what should be expected.